Aside from a tendency to use “forcing” all over the place where, IMHO, the word ought to be “force”, “forces” or “forced” (or better yet, just state what actual physical force is doing what and skip the “forcing” non-noun all together), the article is pretty well written. Sidebar: As an example of my ‘pet peeve’ on ‘forcing’, I think that last line would read much better as “that ocean waters cooled close to the times predicted for strong tidal forces”. Among other useful bits, it answers the question of why the Bond Event average is 1470 years yet many events seem to land on ‘near 2000 year nodes’. As I’ve often pointed out, averages hide more than they reveal. In this case, one can have a period of 1800 years and a couple of anomalous events (often at about a 1/2 period) can shift the average significantly. The IRD events identified by Bond et al. 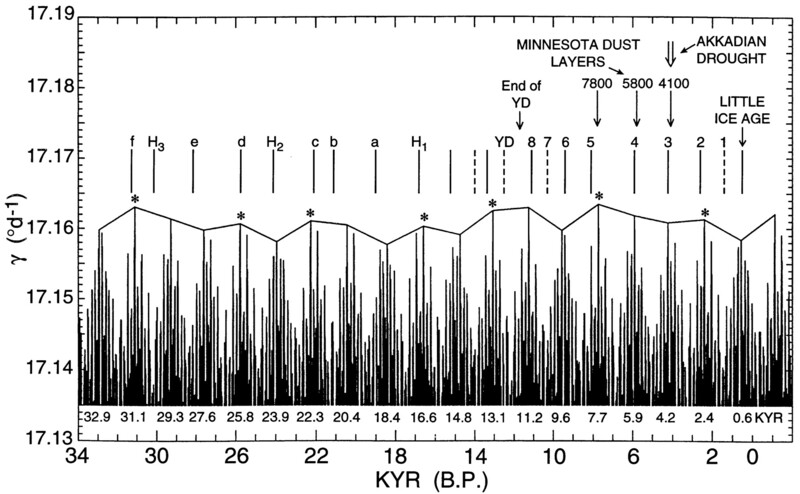 (1, 2) show high spectral power density in a broad band centered at about 1,800 years (0.55 ± 0.15 cycles/kyr). The authors do not explain why this period is so much larger than the 1,476-year average pacing of cool events, but the time-distribution of pacing (ref. 1, Fig. 6c; G. Bond, private communication) suggests that a majority of the events were about 2,000 years apart, with occasional additional events occurring about half-way between, evidently too infrequent to cancel out a dominant spectral peak near 1,800 years. Bond et al. (2) in addition found a spectral peak near 5,000 years whose possible cause was also not explained. We now propose an oceanic tidal mechanism that may explain the basis for both of these spectral peaks, consistent with the actual times of IRD events. This is a nice thing to know. It means that looking at 1000 and 2000 year periods may be more fruitful than 1500 -/+ 500… It also opens the door for a 3000 year beat period of some sort. This will matter when we get to Taurids. It also matters now when looking at the 2000 BC, 0 BC, 2000 AD similarities. Basically, if you find a 1000, 2000, or 3000 year period in climate or history events, they are not in conflict with a 1500 year Bond Event cycle average. We propose that variations in the strength of oceanic tides cause periodic cooling of surface ocean water by modulating the intensity of vertical mixing that brings to the surface colder water from below. The tides provide more than half of the total power for vertical mixing, 3.5 terawatts (4), compared with about 2.0 terawatts from wind drag (3), making this hypothesis plausible. Moreover, the tidal mixing process is strongly nonlinear, so that vertical mixing caused by tidal forcing must vary in intensity interannually even though the annual rate of power generation is constant (3). As a consequence, periodicities in strong forcing, that we will now characterize by identifying the peak forcing events of sequences of strong tides, may so strongly modulate vertical mixing and sea-surface temperature as to explain cyclical cooling even on the millennial time-scale. The basic thesis of the article is that there is an 1800 year periodicity to tides caused by an interaction of the alignment of the moon and earth (syzygy: one of my favorite scrabble words along with zymurgy, though hard to play… ;-) interacting with the periods of perigee and nodal crossings of the ecliptic. Perigee depends on the lunar orbit of the earth seen from the moon, the anomalistic month. Syzygy is dependent on the synodic month (the new and full moon as it aligns with the sun). Crossings of the ecliptic relate to the nodic month. Nodic is 27.2 days. Anomalistic is 27.6 days. Synodic is 29.5 days. These all have a ‘beat frequency’ on tides. (Basically, the moon is only directly in line with the sun/earth axis AND most close to the center of the earth sun line node AND closest to the earth itself at perigee when all those different cycles line up). This is asserted to account for much of the known periodic changes in climate. There are several charts in the article that bring you, step by step, to this chart. I’m just going to put this (rather complicated) punch line chart here. Hit the article for a gentle lead up. You can click on this for a larger version. OK, we have the fall of the Akkadian Empire right on top of one of the peak tide events along with a dust peak layer in Elk Lake in North America (this stuff is global, not just in the Middle East..) Bond Events are numbered in the right half (actually described as ‘ice rafted debris’ events but described as ‘Bond events’ in the caption with solid being conformant and dashed being ones that do not conform with the tides). The ones with a dashed line are NOT on a tidal node, so may have some other cause or may be a harmonic in some way (they tend to fall near the half period). The Younger Dryas is marked with YD. Asterisks mark events that are associated with a longer near 5000 year cycle. I presume that the things labeled Hx are Heinrich Events. The lower case letters are unclear. OK, what is clear is that there IS a long term tidal cycle. It seems to have a striking correlation to significant swings in our climate. It is asserted that this is likely due to various interactions with ice shelves (during glacial periods, by other authors speculating about Heinrich Events) or with ‘ocean mixing’ increases during non-glacial periods (in this paper). I’ve asserted that tidal variation could have an impact via changing the volume of water trying to get through the Drake Passage and this changing how much cold water gets diverted up the West Coast of South America and how fast the jet of water of the circumpolar current spins the South Atlantic. In any case, the methods available for a change of tides and hemispheric water volumes to interact with the oceans and climate is fairly large and can easily account for the changes of climate we see (IMHO). If you want to read how the cycle is calculated, read the article, I don’t see the need to repeat it here. I’m willing to accept that it DOES exist, and look at what that implies. Is there anything else of particular interest noted in that article? Resonance is a constant feature of orbits. Things tend to end up in a resonant relationship to other things. Why is pretty straight forward (though often presented in arcane ways). If things are ‘out of sync’ they get unbalancing forces on them. Those forces either cause the object to have an orbital decay and leave the system (one way or another…) or they drift the object into a more stable ‘resonant’ orbit. There are resonances all over the solar system. They are critical to maintenance of stable orbits AND they are the cause (for the imbalanced case) of things like comet breakups and asteroid impacts. The junk getting kicked out of unstable non-resonant orbits. It’s a critical concept to understanding why the solar system is as it is. But what about all those impact events that are coincident with some of the Bond Events and the Fall Of Empires? How in the world can tides be the cause with all those rock falls? And how can rock falls be causal if the events fall so neatly on top of tides? On the other hand, while the orbits of some particles are quite dispersed, it is still likely that the Taurid stream has a narrow and dense core consisting of particles concentrated near the orbit of the stream’s parent object, which is presumably related to Comet 2P/Encke. As the orbits of the material constituting this narrow, dense core have been subject to perturbations over thousands of years, it may be inferred that intense bombardment episodes have resulted at epochs when the material reaches Earth intersection. Dynamical calculations show that, as a Taurid-like orbit precesses, the northern daytime intersection occurs just a little (a few centuries) before the southern nighttime one, and the southern daytime one just before the northern nighttime one. That is, the four intersections occur in two pairs, and the influx of material to Earth is enhanced during epochs lasting a few centuries and spaced by a few millennia. The term “coherent catastrophism” has been used by astronomers at Armagh and elsewhere to describe the idea that there are strong patterns in the influx of extraterrestrial material to Earth. “Coherent Catastrophism”, eh? Two pairs, separated by a couple of hundred years, returning every ‘few millenia’. Sures sounds like that ‘two impacts’ in 2200ish BC that Timo was talking about with a couple of hundred years between them. Now, my blind leap of intuition here is pretty simple. Tides are driven by solar system bodies. Bodies that move in resonance. Comets are solar system bodies, and Encke (the surviving parent of the Taurids) is settled into a stable (and so, resonant) orbit now along with its debris ‘trails’. We intersect those trails periodically. They are likely to be ‘lumpy’ in the material distribution (as Encke itself attests). Is it really THAT far of a leap to hypothesize that the lumps might just be in a resonant relationship with the Earth / Sun / Moon that cause the tidal cycle? In fact, I’d go so far as to assert that if resonance were NOT present, it would not have hung around for the 30,000 ish years that are supposed. We review the theoretical and observational evidence that, on timescales relevant to mankind, the prime collision hazard is posed by temporally correlated impacts (coherent catastrophism, t ~ 10 2 10 4 yr) rather than random ones (stochastic catastrophism, t ~ 10 5 10 8 yr). The mechanism whereby coherent incursions into and through the terrestrial atmosphere occur is described as being the result of giant cometary bodies arriving in orbits with perihelia in the inner solar system. Hierarchical fragmentation of such large (100 km-plus) bodies due to thermal stresses near perihelion, collisions in the asteroid belt, or passages through the Jovian Roche radius results in numerous ~kilometre-sized objects being left in short-period orbits, and appearing in telescopic searches as Apollo-type asteroids. Many more smaller objects, in the 10 100 metre size range and only recently observed, by the Spacewatch team, are expected to be in replenished clusters in particular orbits as a result of continuing disintegrations of large, differentiated, cometary objects. Gravitational perturbations by Jupiter bring these clusters around to have a node at 1 in a cyclic fashion, leading to impacts at certain times of year every few years during active periods lasting a few centuries, such periods being separated by intervals of a few millennia. Furthermore, fragmentations within the hierarchy result in significant bombardment commensurabilities ( t ~ 10 10 2 yr) during active periods occurring at random intervals ( t ~ 10 2 10 3 yr). It appears that the Earth has been subject to such impacts since the break-up of such a comet ~2×10 4 years ago; currently we are not passing through a high-risk epoch, although some phenomena originating in the products of this break-up have been observed in the 20th century. This most recent hierarchical disintegration, associated with four well-known meteor showers and termed the Taurid Complex, is now recognized as resulting in a dozen apparently asteroidal objects almost 10% of the discovered Apollo population as well as Comet P/Encke. A substantial asteroidal remnant of the Taurid progenitor may still be present in resonance with Jupiter. The implications of the existence of any asteroidal or meteoroidal cluster due to the progenitor are briefly discussed. We emphasize finally the relative importance of active and inactive comets in the cratering record, pointing out the potentially significant contribution by disintegrating large comets to the population of inactive Earth-crossers. The origin of the Taurids was reexamined by Whipple and S. Hamid during 1950. They calculated the effects of secular perturbations by Jupiter on the orbital inclination and longitude of perihelion of nine photographic meteor orbits and found the orbital planes of four of the meteors to coincide with that of comet Encke 4700 years ago. Three other orbits coincided with one another, but not with comet Encke 1500 years ago. The authors theorized “that the Taurid streams were formed chiefly by a violent ejection of material from Encke’s Comet some 4700 years ago, but also by another ejection some 1500 years ago, from a body moving in an orbit of similar shape and longitude of perihelion but somewhat greater aphelion distance….” It was suggested that this unknown body had separated from Encke some time in the past. Hmmm… 1500 years ago… just about 500 AD start of the Dark Ages. 4700 years ago. Just a couple of hundred off from that 2300 BC start of the events leading to the 2200 BC collapse of the Akkadian Empire… Within the error bars, I’d wager. ScienceDaily (Dec. 14, 2009) — It’s the stuff of a Hollywood disaster epic: A comet plunges from outer space into the Earth’s atmosphere, splitting the sky with a devastating shock wave that flattens forests and shakes the countryside. In June 1908, a puzzling explosion rocked central Siberia in Russia; it came to be known as the “Tunguska event.” A later expedition found that 20 miles of trees had been knocked down and set alight by the blast. Today, scientists have coalesced around the idea that Tunguska’s devastation was caused by a 100-foot asteroid that had entered Earth’s atmosphere, causing an airburst. Some 13,000 years earlier, an occurrence thought by some researchers to be an extraterrestrial impact set off cooler weather and large-scale extinctions in North America. The “Younger Dryas event,” as it is known, coincided with the end of the prehistoric Clovis culture. Melott and fellow researchers examined data from ice cores extracted in Greenland to compare atmospheric chemistry during the Tunguska and Younger Dryas events. In both instances, Melott’s group found evidence that the Haber process — whereby a nitrogen fixation reaction produces ammonia — may have occurred on a large scale. ScienceDaily (Apr. 1, 2010) — Some 13,000 years ago the Earth was struck by thousands of Tunguska-sized cometary fragments over the course of an hour, leading to a dramatic cooling of the planet, according to astronomer Professor Bill Napier of the Cardiff University Astrobiology Centre. He presents his new model in the journal Monthly Notices of the Royal Astronomical Society. The cooling, by as much as 8°C, interrupted the warming which was occurring at the end of the last ice age and caused glaciers to readvance. Evidence has been found that this catastrophic change was associated with some extraordinary extraterrestrial event. The boundary is marked by the occurrence of a “black mat” layer a few centimetres thick found at many sites throughout the United States containing high levels of soot indicative of continental-scale wildfires, as well as microscopic hexagonal diamonds (nanodiamonds) which are produced by shocks and are only found in meteorites or impact craters. These findings led to the suggestion that the catastrophic changes of that time were caused by the impact of an asteroid or comet 4 km across on the Laurentide ice sheet, which at that time covered what would become Canada and the northern part of the United States. The British astronomers, Victor Clube and Bill Napier, have acknowledged that Velikovsky may have been correct in suggesting that some myths might have been derived from objects which had been prominent in the ancient sky, and caused catastrophes on Earth, but these cosmic bodies must have been comets, not planets. By extrapolating backwards in time the orbits of Encke’s Comet, the Taurid meteor stream and associated Apollo asteroids, Clube and Napier concluded that all were products of a huge comet which came into an Earth-crossing orbit around 20,000 years ago and began to break up, with particular disintegration events occurring about 7500 and 2700 BC. Fragments would have struck the Earth at intervals throughout the Bronze Age, with devastating consequences. Clube put these ideas before the general public for the first time at an SIS meeting in London in 1982, and developed them at another in Nottingham the following year. Astronomical hypotheses for the purpose(s) of megalithic monuments have mostly been implicitly based upon an assumption that the designers witnessed the same phenomena as those we observe in the sky today. This assumption is not well-based for phenomena having time-constants of order centuries or millennia, such as the populations of comets and meteoroids in the inner solar system and the ephemeral meteor showers and storms which they produce on the Earth. IRAS observations have indicated that Comet Encke has a trail (not tail) of debris some tens of millions of kilometres long, presumably produced since its latest period of activity began about 200 years ago. One may further presume that the Taurid meteor showers we observe in this epoch are the result of the dispersal of trails produced in previous activity cycles which must stretch back to about 20,000 yr ago. When the comet, accompanied by such a trail, has a node close to 1 AU, one expects intense meteor storms to occur, perhaps accompanied by multiple Tunguska-type events if the disintegrating comet spawns massive lumps of debris. Determination of the epochs of such events from backwards integrations is impossible due to (i) Chaotic orbital evolution; and (ii) Non-gravitational forces, but pairs of intersections (one at the ascending node, the other descending) are to be expected a few centuries apart and separated by 2500-3000 years. It is suggested here that one such pair occurred in 3600-3500 and 3200-3100 BC, provoking the construction of the Great Cursus and Stonehenge I. From Stonehenge I, apparently the first construction at the famous site, as the comet neared the Earth it would have appeared to rise in the evening with a huge bright stripe crossing much of the sky, originating in the north-east. Passage through the trail would then result in celestial fireworks (and maybe worse); afterwards the comet and trail would have passed in the direction of the Sun, partially blocking sunlight for a few days. In order for terrestrial intersection to have occurred in that epoch (late fourth millennium BC) the mean orbital period of the comet over the past 5,000 years would need to have been slightly less than at present, and might then be expected to have produced a 19 year periodicity in meteor storm events (six cometary periods). It is suggested that Stonehenge I was built by the Windmill Hill people to allow the prediction of such events, from which they hid in the shelters we now call long- and round-barrows, and that the later developments at Stonehenge (phases II and II) by the Beaker people were a result of a misinterpretation of the original purpose of the site in terms of lunar and solar observations, a misinterpretation which was re-discovered by Newham, Hawkins and Hoyle in the 1960’s. DUNCAN STEEL is director of Spaceguard Australia and Vice-President of The Spaceguard Foundation. Steel took B.Sc. and M.Sc. degrees at the University of London, studying at various colleges, and then moved to the University of Colorado where he worked on NASA’s Pioneer Venus Orbiter program. He then moved to New Zealand, where he took his Ph.D. degree at the University of Canterbury for work on radar observations of meteors. He continued this work from 1985-96 at the University of Adelaide, Australia, spending 1987 as an ESA Fellow at the University of Lund, Sweden. From 1990 until its termination in 1996 he directed the only southern hemisphere program for the discovery and tracking of near-Earth asteroids, based at the Anglo-Australian Observatory. In connection with this he has served on various international committees, including NASA’s Spaceguard committee in 1991-92 and the International Astronomical Union’s Working Group on Near-Earth Objects since 1991, and Working Group on the Prevention of Interplanetary Pollution since 1988. He is the author of over a hundred scientific papers, and the book Rogue Asteroids and Doomsday Comets” (Wiley, Chichester and New York, 1995). In addition, he has appeared in numerous TV and radio documentary programs concerned with the impact hazard. Presented at the SIS Conference: Natural Catastrophes during Bronze Age Civilisations. The study of Near Earth Objects (NEOs) is becoming one of the most exciting areas of modern astronomy, and as the science progresses, historical writings and the myths and legends of prehistoric times are being looked at again in a new light. The current focus on re-interpreting ancient myths about battles between ‘sky gods’, ‘dragons breathing fire’, and ‘thunderbolts from heaven’, as containing the accurate observations of ancient skywatchers, is much in the same vein as the pioneering work of Owen Morien Morgan, who decoded the druidic folklore of the South Wales valleys, revealing the druidic oral traditions that symbolically depicted the constant interplay between the Sun, Moon, Earth and planets throughout course of the natural year. It is becoming evident (October 1997) that ancient peoples have, throughout the past several thousands of years, migrated away from areas devastated by periodic bombardments of cometary debris. These hurried migrations of refugee survivors were likely due not only to the destruction of centres of civilisation, but also as a result of the “Cosmic Winter” caused by the cometary dust-loading of the upper atmosphere which gave rise to abrupt climatic changes – rapid drops in temperature that undermined the agricultural base sustaining those societies. The burial of bulls may also have been of a relatively late date compared to the dates of the construction of these stone chambers, which would have acted as ‘telescope-type’ chambers inasmuch as they would allow for the fainter stars to be observed at night. And, more importantly, they would have allowed for accurate observation of the ‘heliacal rising’ of specific stars in the final half- hour or so before actual sunrise. As the major meteor storms of the Bronze Age and before were those that appeared to emanate from the constellation of Taurus (the Bull), then it must be considered that the ‘bull burials’ which have been found in various ancient structures all over the world could well have been the result of an apparent widespread practice of ‘sacrifices’ to appease the anger of various ‘gods’. In ancient oral traditions, this ‘anger’ was almost always shown by the sending of ‘thunderbolts’ and the like, which are recorded in the mythologies and oral traditions of almost every ancient culture in all corners of the globe. Could these sacrifces have been of bulls because of the Taurid Meteors Storms that had caused such widespread death and destruction throughout antiquity? And, how far back did this go? Our planet encounters the beta Taurid Complex between June 24 and July 6 each year, and it takes the Earth about 12 days to pass through these streams. The second annual encounter is generally between November 3rd and the 15th each year, when they can be seen with the naked eye as ‘shooting-stars’ in the night sky appearing to emanate from the areas of the constellations of Taurus and Aries. With the stars of the constellation of Taurus in the background behind the Sun in May and June, the meteors appear to come directly out of the Sun. They would not actually be ‘seen’ until larger meteoroids (particles of cometary debris) came right through the upper atmosphere and impacted the Earth, or burst in the atmosphere a few miles above the ground, as did the widely reported ‘fireball’ of the Tunguska air-burst on June 30th 1908. It goes on at some length about using caves and artificial caves to enhance seeing of the precursor stars to Taurus. Not so sure I’m buying that… It seems to me it would be easier to just watch the night sky and create a calendar. At any rate, it’s pretty clear that a few Tunguska events all happening at once could really mess up your day and there WERE more of them in the past. The Taurid stream has a cycle of activity that peaks roughly every 2500 to 3000 years, when its core passes nearer to Earth and produces more intense showers. In fact, because of the separate “branches” (night-time in one part of the year and daytime in another; and Northern/Southern in each case) there are two (possibly overlapping) peaks separated by a few centuries, every 3000 years. Some astronomers note that dates for megalith structures such as Stonehenge are associated with these peaks. The next peak is expected around 3000 AD. The Taurids also have more frequent peaks which may result from a heavier concentration of material in the stream, which only hits Earth during some passes. What I suspect is that the 3000 year peak is a bit optimistic. In particular, I’m expecting there to be some resonant peaks at about the 1/2 period of 1500 years and at the 1/3 and 2/3 periods of 1000 years and 2000 years. Exactly which ones are how populated TBD… That we got whacked in 2200 BC would imply a 800 AD ‘repeat’, and I don’t remember seeing one written up. I think that there is very good evidence for BOTH a tidal / ocean driven cycle and a cometary impact cycle in climate history. This entry was posted in AGW Climate Perspective, Science Bits, Stonehenge and tagged Climate Change, comets, Global Warming, impacts, Stonehenge, weather. Bookmark the permalink. Something to keep in mind, missing in much of the climate discussion, is that mankind has always benefitted from advances in scientific knowledge. Understanding and predicting climate variance is pretty interesting. A difference between us and the Hittites is that we have much better technology to cope with a varying world –a clear example is he drastic reduction in fatalities due to severe storms. The variability is not the severity of storms, but our increasing ability to build resistant structures, and manage medical and public health issues. A 2000 year cycle due to orbital mechanics as a causative factor in history is pretty cool. A panic that we have to send rockets out to move planets around would be the analogue to the “reduce carbon” panic being foisted upon us. I’m still of the opinion that though it’s probably not relevant to my generation, what mankind really wants to figure out is the timing of the next glaciation — these are the events that have seriously threatened the species. Would it be possible to increase the contrast of your typeface to make this blog easier to read? It is very faint in my new LCD screen. Only if I change the entire “theme” (which is something I’ve though of doing…). Basically, I don’t know what risks there are in swapping themes. FWIW, on my LCD screen a change of screen angle often gives much better contrast. At any rate, I look into it. “A large fraction of the objects on Earth-crossing orbits, of all dimensions, are the daughter products from the break-up of a giant comet some time during the past 100,000 years, dynamical studies suggesting around 20,000 years as likely. All that is suggested here is a break-up similar to that undergone by P/Shoemaker-Levy 9 in 1992, except by a comet at least 100 kilometres across and in an orbit crossing from Jupiter to the Earth. So it looks to me like there is every opportunity to have a couple of swarms that account for some of the ‘half Bond Event” periods along with doing some added damage in some of the other Bond Events. In particular the 2300BC-2200BC interval and the Dark Ages around 400-600 AD. Mike Baillie is Professor of Palaeoecology at Queens University, Belfast, Northern Ireland. He is an authority on tree rings and their use in dating ancient events (every year, a tree adds a “ring” to its trunk as it grows – good years are represented by thick rings while bad years are represented by thin rings). He conducted a complete (and continuous) review of annual global tree growth patterns over the last 5,000 years and found that there were five major environmental shocks that were witnessed worldwide. These shocks were reflected in the ring widths being very thin. Wanting to know more, he turned to human historical records, and found that the years in question (between 2354 and 2345 BC, 1628 and 1623 BC, 1159 and 1141 BC, 208 and 204 BC, and AD 536 and 545) all corresponded with “dark ages” in civilisation. The calculations for the Taurids suggest that we pass through the core of the meteor stream approximately every 2,500 years – today, we are passing through the outer edges. The last two occasions when we passed through the core were in 2200 – 2000 BC and in AD 400 – 600. The epoch around AD 3000 looks like being a fun time too – the Y2K doomsayers can always say they just got the millennium wrong. What is interesting to me is that we have evidence of significant climate changes on decadal, not even century or millennium timescales. The Younger Dryas appears to have ended in Greenland over a space of about 10 years time. It got cold, really fast, stayed cold for about 1500 years, then got warm really fast over a space of one person’s lifetime. The problem is that we have so little recorded history. The archives of many civilizations burned, often several times. Our history of today won’t survive long because it is becoming mostly electronic. It can evaporate rather easily (or be easily changed later). I almost which I could put down a chronicle in gold leaf or something that would survive the ages. Might “Nemesis” be not a star but a place in time? E.M., when you continue to carefully watch all the pitches (research areas), you do have a unique way of finding the one possibility that knocks it out of the park — grand slam. I am certain that you are covering four bases at the very least. Great reading. But do you realize how much other reading — your many posts, others’, multiple research articles — this venture entails? I am running out of file cabinet space. (I am a book- or paper-in-the-hand person. Ahhh, the great pleasure. In addition, I don’t trust that the digital memory will always be there.) It is very exciting as you move us into new territory — solving the “riddle” of rapid, extreme climate change! Now, on to communicating to a wider public and preparation for adaptation? With respect to impacts, as I look through my files. I find two Napier papers (2009, 2010). I appreciate the context in which you place the info. Then there is the Holocene Inpact Working Group, much of the research you cite might have come from their members (“Ad hoc group called the Holocene Impact Working Group (HIWG) was created as follow-up the Workshop on Comets/Asteroid Hazard that was held in the Canary Islands in December of 2004. The group includes the researchers from different field of geoscience who believed that Holocene comet impacts were more frequent in the recent past than the accepted view.”) They no longer post publicly. I have a summary article by D. Abbott, E. Bryant, V. Gusiakov, and B. Masse (2009 or 2010) “Largest natural catastrophes in Holocene and their possible connection with comet-asteroid impacts on the Earth” There are a number of other names, some familiar, e.g., Baillie, Firestone, whose work has received great opposition. The idea of frequent, perhaps cyclical, impacts has waxed and waned with new evidence and then (often ferocious) destruction of its relevance. Perhaps we will see a new renaissance in interest and research if we can add predictable extreme climate change. I like the idea that those Henges were for more than equinoxes and planting guides, even if this would be enough inspiration. And those bulls have been of special importance since at least Catal Huyuk (~10,000 ya). Might be of no value whatsoever, but Dennis Cox at craterhunter.wordpress.com has been looking for impact evidence along the same lines. There seems to be a common complaint among interested impact researchers that it is very, very difficult to get a significant number of scientists — even in one’s field — interested. One thing about Henges etc. for farmers and planting dates. Farmers don’t need priests or bureaucrats to tell them when to plant or harvest. Thanks for pointers to the other sources. I’m not likely to spend a lot of time on impacts other than to catalog the largest and least controversial of them and look for interactions with the other cycles (tidal and solar) to give beats. I’ve found enough already to show that there are cyclical impact storms of a size to shift history. Encke at least and it looks like at least one other from the actual frequencies (nodes at about 1000 years with the sporadic 500 step). Under normal circumstances, yes. While I’m not wedded to the idea, my ‘working whacky thesis’ is that things like Stonehenge come about when things are not normal. The usual queues go off track and some folks decided to ‘do more’ for a better answer. So, take “1800 and froze to death”; a lot of farmers didn’t plant at the right time then… So I could see a meteor storm in 4000 BC that causes whacky weather leading to a ‘how do we predict this stuff’? with the ultimate motive being avoidance of crop failures and famine. So while I’m quite certain most farmers can tell when spring comes (and more importantly, the seeds will germinate when soil temp rises above a threshold anyway – variable with each seed type but generally over 50 F or 70 F – so actual planting time isn’t all that critical. The plants worked out this variable timing thing a ways back ;-) I’m less certain that they would be able to optimize in a highly variable world. So yes, farmers can quite well figure out when to plant, and do a pretty good job on ‘what’ as well. AND I see no reason for them not to band together and make a henge for greater precision and accuracy in chaotic times. During the LIA the French had a thing for wheat and tried to stick with it until Le Grande Revolution, Louis XVI’s Department of Ag didn’t do too well at all, I think they all lost their heads over the crash of the wheat market. Meanwhile, in merry Ol’ England, the Brit’s ate all their wheat seed and switched back to the hard grains and had their cake (and bread, and beer, ale, grog, and whiskey too), hense no Grande Revolution in the UK (or the Neatherlands, or Germany, etc.). I understand French grapes took a beating as well. One thing a good Frenchman cannot abide is starvation. FWIW, I’m shifting my gardening efforts from a focus on the common bean, tomatoes, corn, squash; and toward kale, cabbages, potatoes, peas, parsnips etc. I’m learning more about growing ‘cold and wet’ tolerant garden plants. The weather so far has justified this shift. Nice to see Keeling concluding that tidal forces are capable of impacting on hemispheric scale climate. Guys like James Hansen are unlikely to be happy about this. It potentially reduces the need for greenhouse gasses as agents of climate change. It also helps explain why climate change occurs first and change in the concentration of atmospheric greenhouse gases tags along some time later. In addition we could postulate that the tidal processes change oceanic circulation sufficiently to alter sea surface temperatures and surface air temperatures. Possibly outgassing of greenhouse gasses from the ocean is not controlled directly by temperature, but rather by change ocean in circulation. But the lag is slightly greater than for surface temperature? Well there it is. I sed sumit. That paper on an 1800 year cycle of tides deserves a lot more thought. That CO2 link is an interesting possibility, for one. Once you have a longer term tides cycle, a lot of things start to drop into place. For example, it doesn’t take some ill defined ‘random oscillation’ of the ocean. It has a physical driver. The cycle is indirectly tied to the rest of the orbital mechanics, so suddenly the 179 year “solar barycenter” argument doesn’t have to get past low solar tides, it can point to earth water tides. It just has a lot of ways to go with it. Keeling is an experienced scientist as well and not previously recognised as a sceptic to any significant extent. He wll be difficult to blow off. If I was on “the team” I would recommend that the work should be ignored for as long as possible in the hope that it will either go away or fade away. But as a sceptic I would suggest that the work merits close attention. I was comparing BEST with GHCN v2 and found something odd. 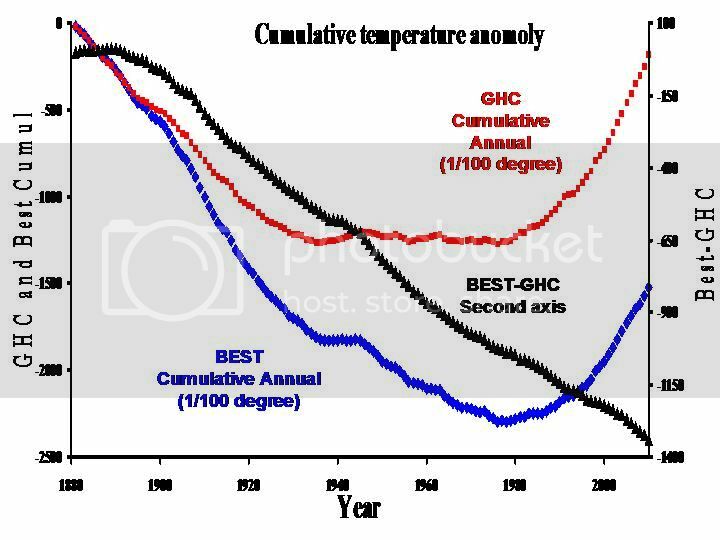 I created cumulative anomaly plot; adding annual anomaly from 1981 to 2010, of both BEST and GHCN v2 and then looked at the difference. What GHCN tells us is that there was cooling from 1900 to 1935, a flat part and then a rise with the 1980’s introduction of the RS2S2 interface. Sorry for the late response… but I just got to look at that graph. Very Interesting. Took me a while to realize what you meant by the RS2S2 interface. That was when we moved to electronic thermometers using the short cord and they moved closer to buildings (and got power sources inside them…) I learned it as RS-232 interface. which talks about detailed calculation methods of the Indians and Tibetans. It looks like they had a keen interest in knowing about the return of Encke. They thought comets would bring bad luck. The page has images of the Tibetan manuscripts. 700 years old. It says the Tibetans knew about four comets, which were seen as “emanations of the pseudo planet sGra-gcan, responsible for earthquakes and eclipses”.